Only 13 out of 35 public swimming pools in Cape Town remain open. The rest are closed in a desperate bid to preserve our precious water reserves. These days most private pools are looking more like frog ponds. Thankfully our surrounding oceans have plenty of water. 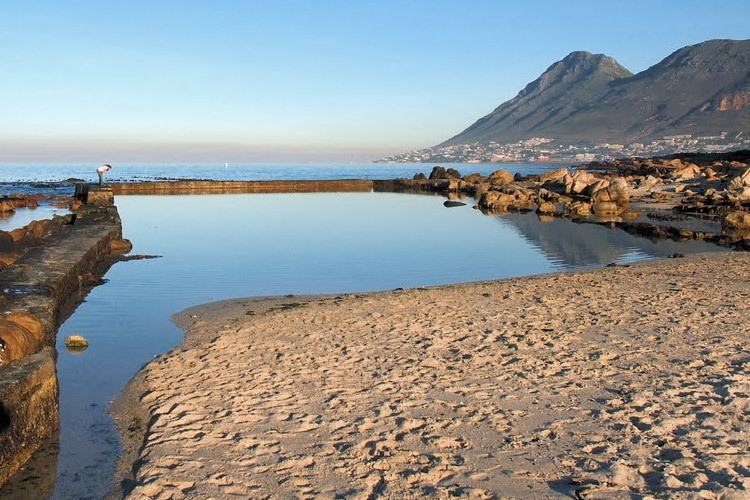 Our coastline boasts a range of natural tidal pools offering welcome relief from a sweltering Cape Summer. The best part is that they don’t put a burden on our water supplies. And not only that they also offer bathers a safe, sheltered and family-friendly space to chill without being dunked by any wild waves. As the tides change, so nature takes care of the filtering system, keeping their treasures healthy, pristine and super-revitalizing. 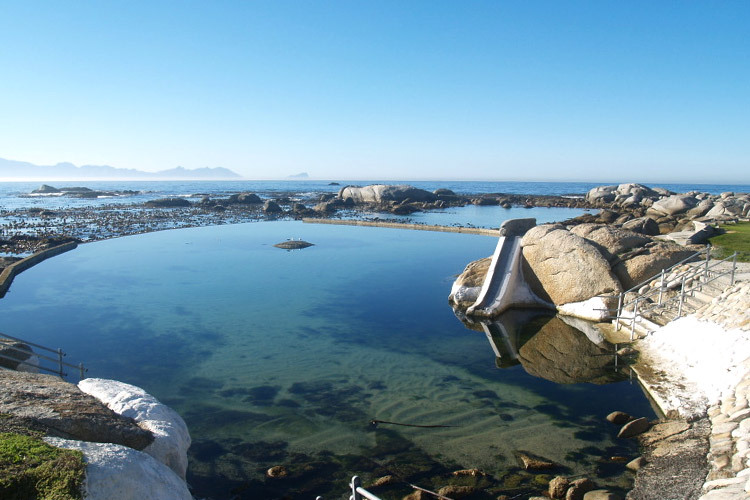 The quaint hamlet of Kalk Bay is not all about boutique and antique treasure shopping, it also boasts an abundance of tidal pools. Dalebrook is one of them and is also the most beautiful. Its become a favourite amongst locals and some travelers have discovered its charm too. Some cyclists stopover here to cool down on their way back from a ride to Simonstown. It’s recommended to get there early in the morning, as it loses its sun in the late afternoon. What makes it special – It’s the position, views over the horizon and it’s easy to miss, making it not as crowded as others. The pool also features large boulders for swimmers to languish on. It has a low wall, which means its regularly kept clean with a consistent flow of new freshwater breaking over the wall. There are public change rooms and an outdoor shower. (the shower is currently disconnected due to the drought). Wooley’s may not be as big as Dalebrook or St James, but it has its own virtues. A unique feature is a smaller pool, tucked away in the corner of the larger tidal pool. This is perfect for younger kids to paddle in, while the larger pool is perfect for the more experienced swimmer. The flat rocks offer an ideal perch to sit and watch the waves crashing. They are always slippery, so move with caution. Wooley’s is easy to miss, providing a less crowded alternative to the popular St James Tidal pool (although it does draw more visitors during holidays). 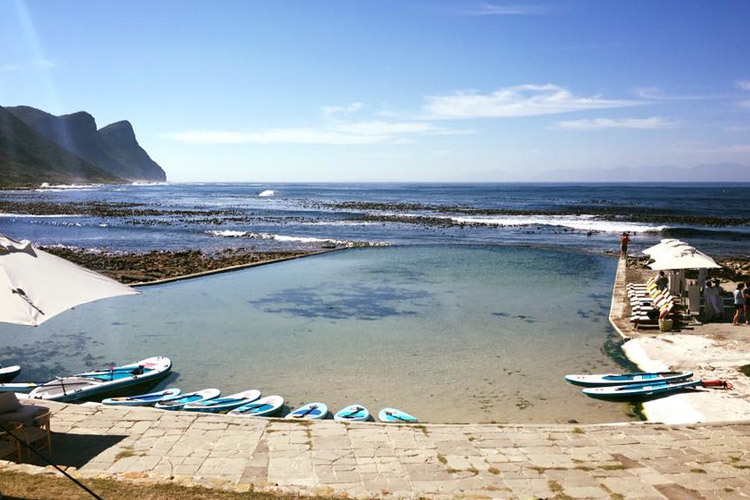 It’s more secluded and smaller than the rest of the pools in Kalk Bay. 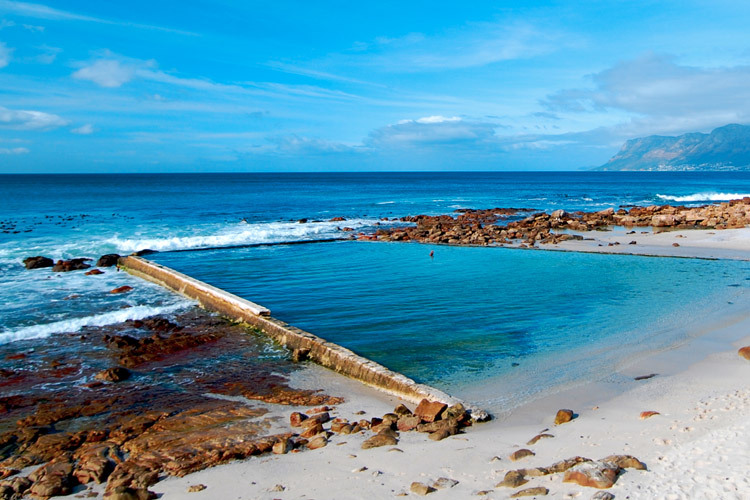 Probably the most well-known and popular tidal pools, it’s neatly tucked between Muizenberg and Kalk Bay. The beach and tidal pool get very busy during Summer, so you must get there early if you fancy a more peaceful cool off. St James is a sheltered, and family-friendly beach, so it’s perfect for sunbathers and young families, though surfers can ride the reef here, too. The backdrop offered by the iconic multi-colored change rooms add a bright splash of colour in contrast with the aquamarine waters below and children playing on the beach. It paints the idyllic seaside picture. A scene that features in many postcards and paintings too. It’s located close to a very special beach, Glencairn Beach, which is a gentle, family- and dog-friendly beach that’s ideal for swimming, snorkeling, sunbathing and long strolls. Both beach and tidal pool are easily visible from the railway line and, like the St James Tidal Pool, it cradles a portion of the beach protectively enclosed within its old walls. Miller’s Point was originally a whaling station in 1825. When whaling was banned, the cost remained virtually untouched for almost a century. 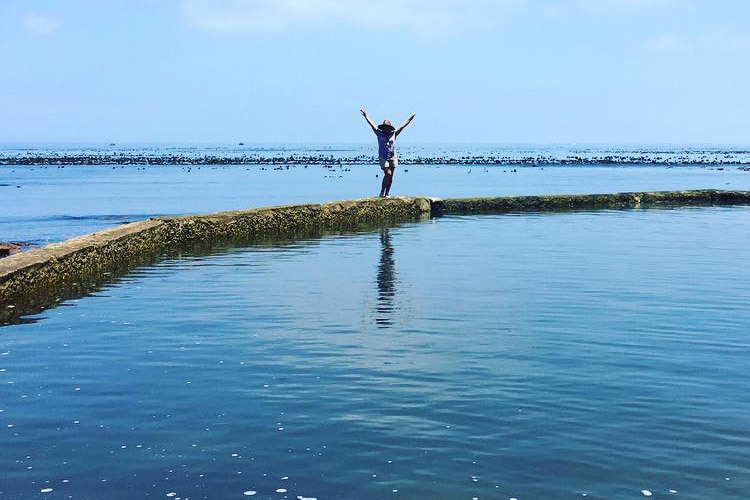 This lesser-known tidal pool can be found in Rumbly Bay wedged between two boat launch sites. The area is prone to baboon foraging, so do be cautioned. The tidal pool is a real treasure, offering some natural rock pools and a fun water slide. There are change rooms, grassy picnic and braai spots too. 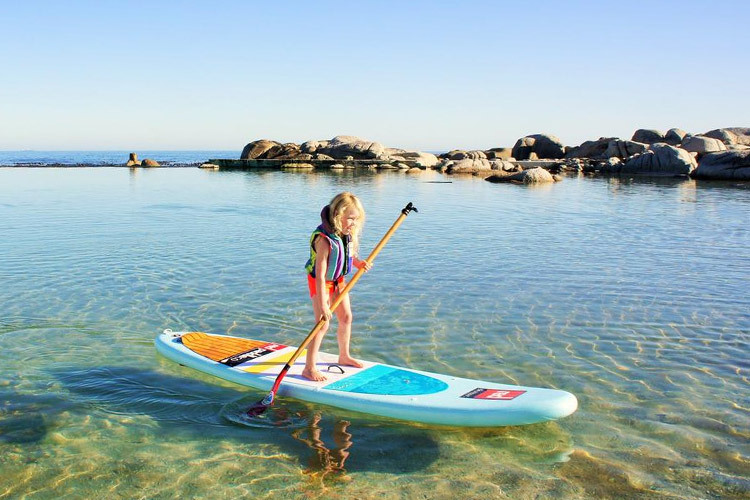 What makes it special – There are so many other great offerings like kayaking, snorkeling, surf-skiing and scuba dive sites at Partridge Point, Castle Rock and Smitswinkel. The location has spectacular views of the rocky bay. It’s also a popular whale-watching site in whaling season. This incredible strip of coastline was proclaimed a nature conservancy in 2009. It was named for the freshwater pools that form because of rainfall. 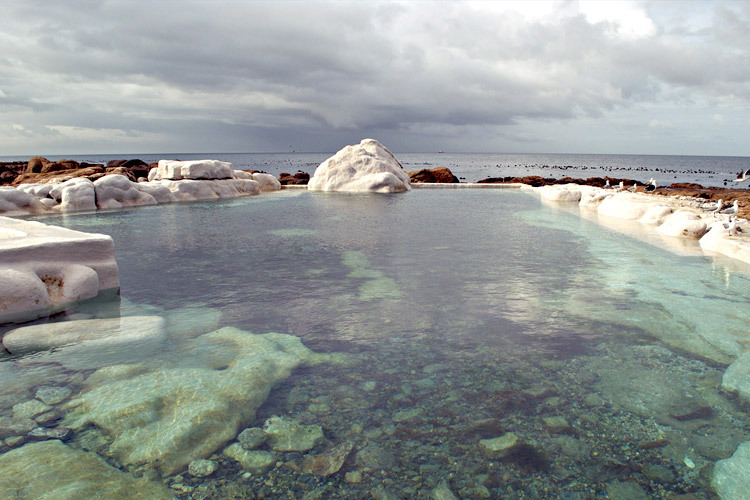 The tidal pool can be found south of Kommetjie, adjacent to a braai area and picnic site that forms part of the Soetwater recreation area. The pool makes for the perfect and refreshing dipping spot amongst the thriving biodiversity. What makes it special – The natural bounty and richness of the surrounding environment, made up of rocky shorelines and pristine white beaches. Inhabitants of this region include the African Black Oystercatcher, an endangered bird species. 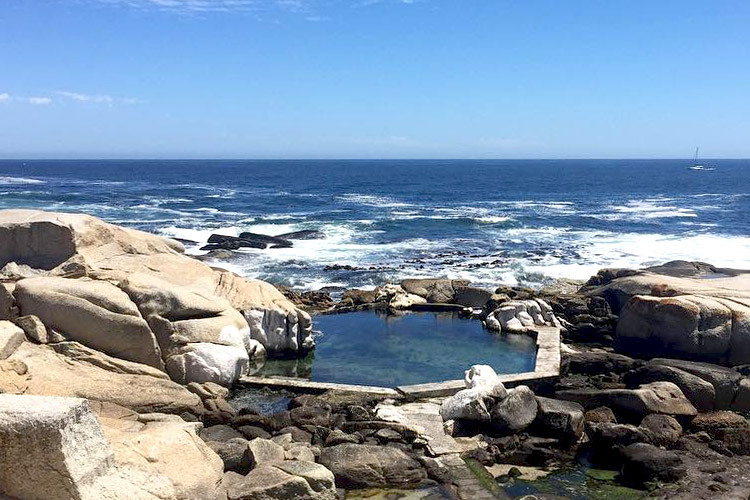 Bantry Bay serves up a picture-perfect white sandy beach and this tidal pool is nestled in a protected corner. The pool is a popular swimming destination on weekends and holidays but is uncrowded during the week. The location is ideal for sunbathing, a late afternoon dip followed by a mesmerizing sunset. What makes it special – The large granite rocks create a wind barrier, giving it shelter on those hot – but windy – summer days. You can also top off your swim with a fine dining experience in nearby Seapoint or Moullie Point. 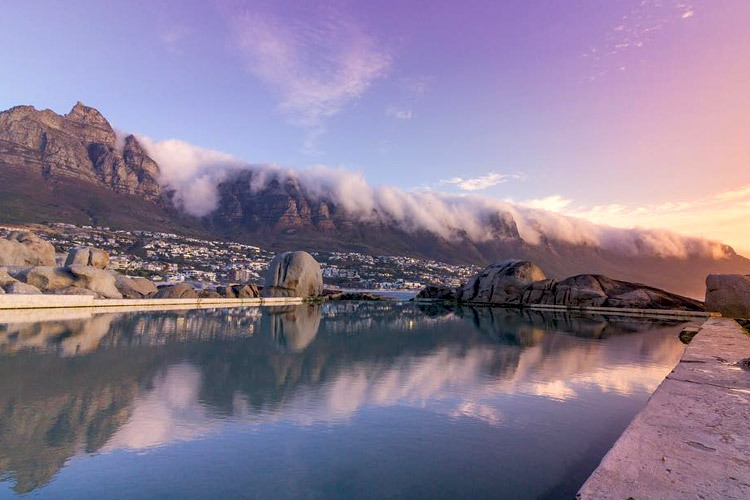 If surfing or tanning on the famous and sun-drenched Camps Bay beach isn’t your thing, then the beautiful tidal pool is perfect for a revitalizing dip. It’s also a safe place for younger kids to paddle around it. These pools are another hidden treasure for an energizing swim and sun-soaked picnic. Concealed among clumps of rocks, these tidal pools offer spectacular views of the mountain and ocean. Whales and dolphins have been sighted during the whale-watching season (June to December). What makes it special – Besides boasting some of the best views you’re likely to find from any poolside, Maiden’s Cove has a grassy area that’s perfect for a braai or picnic, making it ultra-family-friendly. Buffels Bay is a relatively sheltered and crowd-free beach. The bay presents jaw-dropping white sands, crystal clear blue waters, and green lawns. 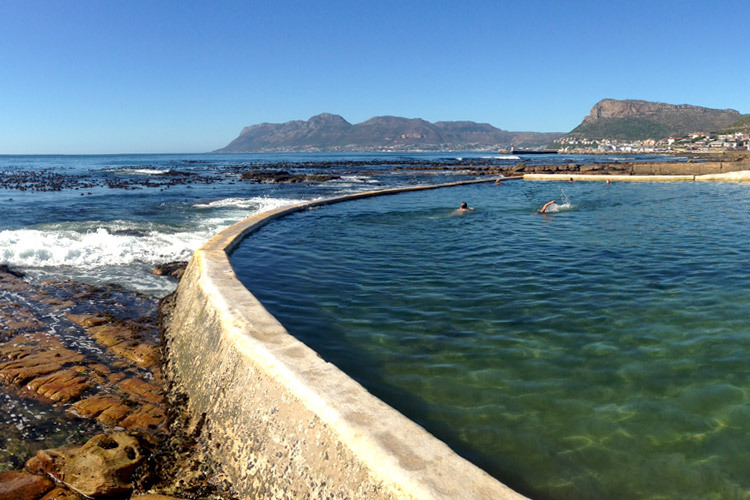 It is ideal for picnics and braais, and the safe tidal pool is great for a post-hike (or -cycle) dip. What makes it special – The area is rich in biodiversity, abundant in flora and fauna, such as eland, bontebok, ostriches, Cape mountain zebra, and hundreds of different bird species. Original article appeared in The Inside Guide.